Twenty years ago, in the winter of 1993, I auditioned to be a street actor in Barkerville. I got the job. I had been to Barkerville once before as a child, and the memory of it was vivid. I loved it. So, as a young adult, I thought I’d try it out professionally for a season. I would see if Barkerville fit me now. When May rolled around and the rehearsals drew near, I packed the car and pointed it north. Fourteen hours later I found a place called Wells. Approaching Wells for the first time feels a lot like approaching Wells for the twenty-thousandth time: the road winds lazily around Cow Mountain, Jack o’ Clubs Lake appears like an old friend on your right, and the old Cariboo Gold Quartz Mine tailings stand guard at the small town’s entrance. Just before crossing the bridge toward Barkerville you can see that there are exactly three ways to go – left, right or straight ahead. My mood during that introduction to Wells all those years ago vacillated between “this is so cool” and “what have I gotten myself into?” Thankfully it wasn’t long before “cool” kicked all the question marks into oblivion. This place was cool. The next day, after settling into my Wells apartment (my digs for the next few months) I headed to Barkerville. It was sunny, but the air still smelled like winter. The sky was, to steal a line from Stan Rogers, “a painful blue.” St. Saviour’s church loomed over the frontier streetscape, and everything smelled old. It felt right to me. It felt like coming home. I knew then that this was the kind of place that grabs you by the hand and makes you a part of it without hesitation. Two decades ago Barkerville claimed me. For the next eleven years I came “home” every May. Driving here after months away always felt as fresh and exciting as that first time in 1993: the mountains, the lake, the tailings, the three directions… and Barkerville. I am no longer a seasonal resident of this place; I live in Wells year round. I am no longer a street actor in Barkerville, but work at the Theatre Royal. I don’t get to experience the drive back to these mountains for the fresh start of another season anymore. But every spring I get to relive the feeling of that little party inside that used to come from arriving back here after a long time away. I relive it through the other actors and interpreters and summer workers who head back to Barkerville from some other place. I relive it through those visitors who come back year after year, and through those who return after a long absence, reassured by the familiar shapes and curves and smells and landmarks. It’s like a childhood memory that doesn’t distort with the passage of time. Coming here is coming home. 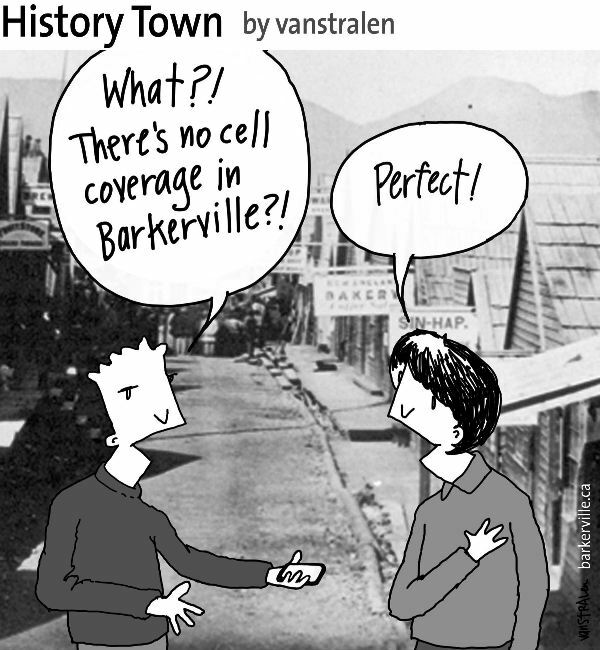 The above one-panel cartoon by Dirk Van Stralen, along with the accompanying editorial by Danette Boucher, is the first of twenty weekly entries that will be logged – and subsequently blogged – as part of a 2013 collaboration between Barkerville Historic Town and The Prince George Citizen aimed at introducing some of the quirkier advantages to living, working, and playing in the Cariboo Goldfields. We hope you enjoy!